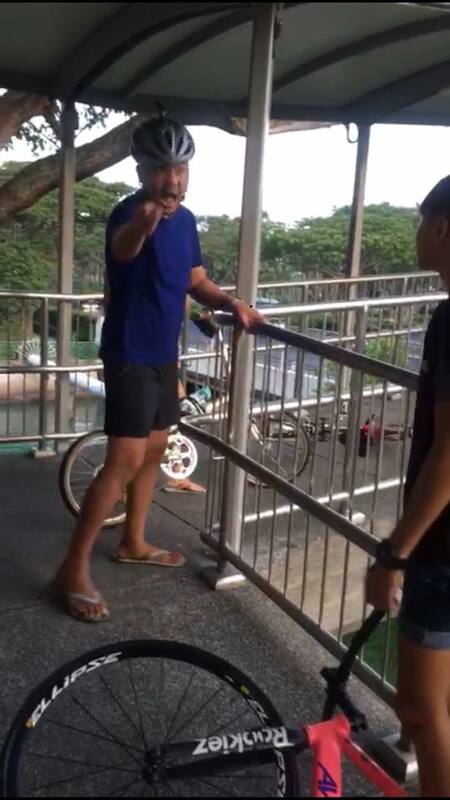 In a messy situation that was partly caught on camera, a boy who was cycling across ECP overhead bridge accidentally ran over the foot of a man who was wheeling his bicycle across the bridge. The man did not take too kindly to having his foot run over and allegedly pushed and kicked the boy. What the camera did catch, however, was the man doing a lot of shouting. 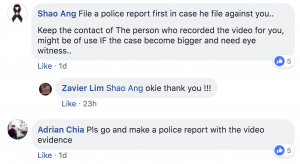 Netizens who saw the boy’s Facebook post about the incident strongly encouraged him to go to the police and file a report against the shouting man. Lim’s photos and video (taken by another man, whose voice can be heard) only capture the aftermath of the controversial incident, so we do not see the boy running over the man’s foot and the man kicking and pushing the boy. What we are privy to, however, is the man, clearly enraged and having a proper shout-fest at the boy. The man’s companion on the bridge, a woman, had her phone out also and was taking a video of the situation. Boy who ran over man’s foot (Lim) : “Jiao (call)”. That is what went on in the video. The man whose foot got run over was fuming; getting his foot run over was clearly not something he would let go of easily. 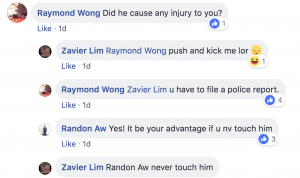 Lim, who also seems pretty offended that he got pushed and kicked by the man, claims that it was an accident that he ran over the man’s foot. 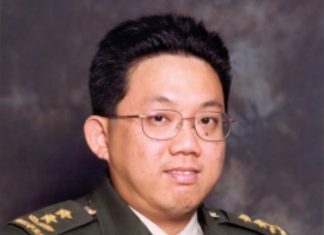 On video, the woman who was with the man said that Lim never said sorry, but the other man, who was taking the video, was heard saying that the boy was never given a chance to apologise. Interestingly, no apology is heard from Lim for the entire video (or from the man, for that matter). Tensions were high, and voices were raised. It really was not an amicable situation. 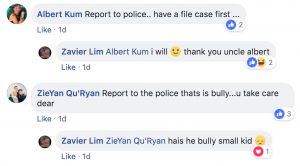 After Lim posted the photos and video on Facebook, netizens responded, condemning the bullying, showing support for the boy and encouraging him change his post to public and to file a police report against the shouting man. Incidentally, cycling on an overhead bridge is not allowed, as seen here in this Intra-Town Cycling Guide issued by the Land Transport Authority.